The Phase 1 area of Union Square on the former Police Station site between Princes Street, Gordon Road and Fleming Way. 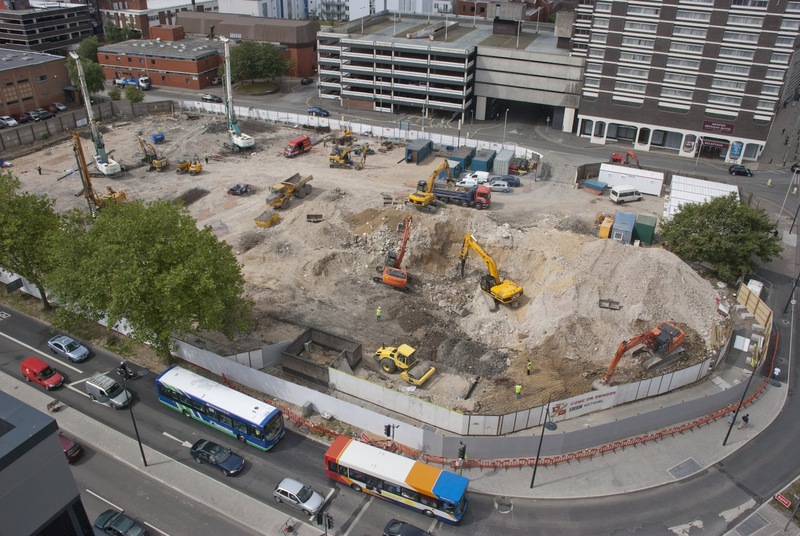 An 850 space multi-storey car park, 45 sheltered housing units, space for the new NHS walk-in centre and offices are currently being built. Sometimes a regeneration is so big, there's only one way to see it from, above. So, yes, you've guessed it, another rooftop! This time, the roof of the Jurys Inn on the corner of Fleming Way and Princes Street gives a perfect spot to watch the changing face of Swindon with the Union Square project. 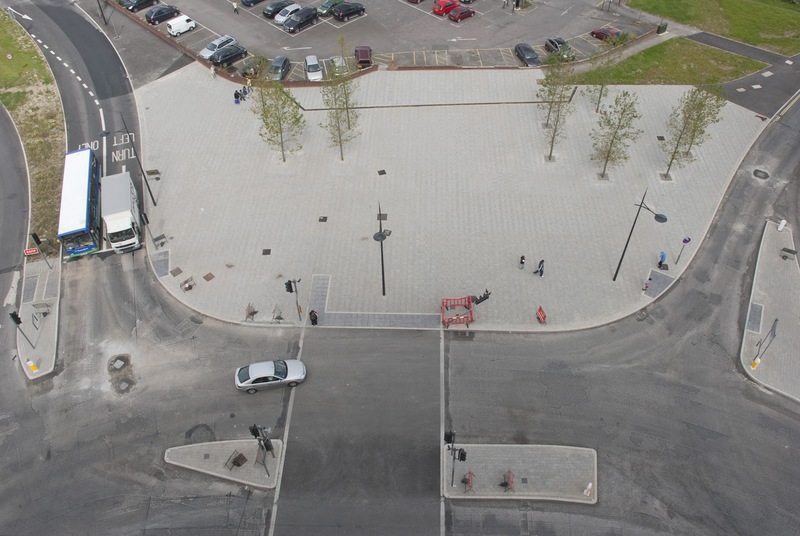 The first phase of works on Union Square is completed, the new Whalebridge junction. On the vast empty plots of land around Princes Street, Fleming Way, Corporation Street and Manchester Road the project will provide 650,000 square feet of office space, room for a new NHS Walk-In Centre, a 100-bed hotel, 150,000 square feet of retail, cafe and restaurant space, 450 residential units, an 850 space multi-storey car park, a new bus station, lowering of Fleming Way, a new public square, new road junctions at Whalebridge and Gordon Road, and new public spaces. 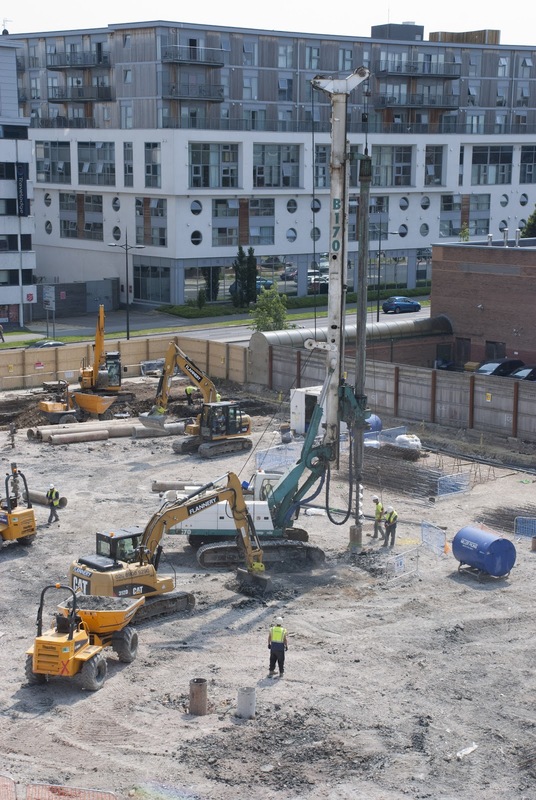 Piling work has started on the Union Square Phase 1 area. The work on Union Square is phased over 10 to 15 years, a scheme of this type has never been seen in Swindon before. It will entirely change the town centre, there's no doubt about that. The first phase is well underway on the land of the former Police Station between Gordon Road, Fleming Way and Princes Street. The car park, sheltered housing units, and offices are currently being built (space will be provided for the NHS Walk-In Centre on the Phase 1 site). The land in the middle-ground, the open car park, walk-in centre and fenced space will be Union Square Phases 3 and 6. The Union Square project will stretch all the way along Corporation Street to the junction of Manchester Road and then along to the present bus station at New Bridge Square. The current bus station and multi-storey carpark, along with the vacant land will be brought back into use for houses, offices, shops and public spaces. One interesting touch in the design is the resurrection of several former street and road lines that were lost when the land was previously developed. The line of Broad Street and Carfax Street is retained and the line of Gordon Road will continue across Fleming Way. Because the majority of Union Square is based around a pedestrianised centre space, making the new development inviting for people as a thoroughfare is central to the design of it's layout. An artist's impression of the Union Square project, looking immediately north of Fleming Way. The Zurich Tri Centre is the white building, with the buildings in the right foreground occupying the site of the former Post Office. 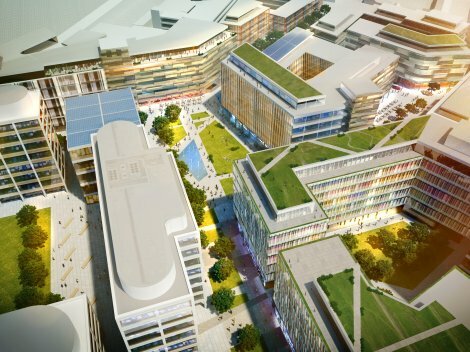 These buildings are Phase 2, with the buildings across the new public square Phases 4 and 5. 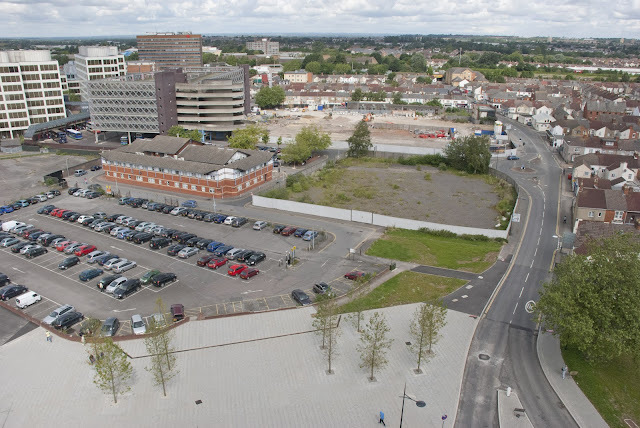 What are currently empty, unwelcoming spaces in the very centre of Swindon will be brought back into use where people will live, work and relax. For Union Square and Swindon, it's just the beginning.